This past weeks declutter turned out pretty good. I only had less than 1 pound of trash to take out after I was done going through the shoe rack, closet and dresser. There are currently four bags of donations waiting to take to a local thrift shop! After my last bit of donations from the kitchen challenge, I decided to list out and give a value to the items I am giving away. Also, I am learning to take my items to a store I don’t visit very often. It’s a hoot when I am visiting GW and see something I gave to the store! There was a 50% off day at GW this past weekend. I didn’t go but instead started a project list of items that either need to be cleaned, painted or re-purposed. It is my goal to show you the things I do with all my thrifty finds. May end up as Thrifty Daze Thursday! I also ended up re-purposing a vintage frame to store my earrings. I now have a place for my earrings and it adds a bit of charm to my dresser. I used left over shelf liner from the Kitchen ReDesign and taped down the sides to the glass. I inserted it back into the vintage frame and set it on the dresser. I think it works very nicely with the rest of my decor. I apologize in advanced for the poor quality of the photos. I am a noob to this! Very cool! 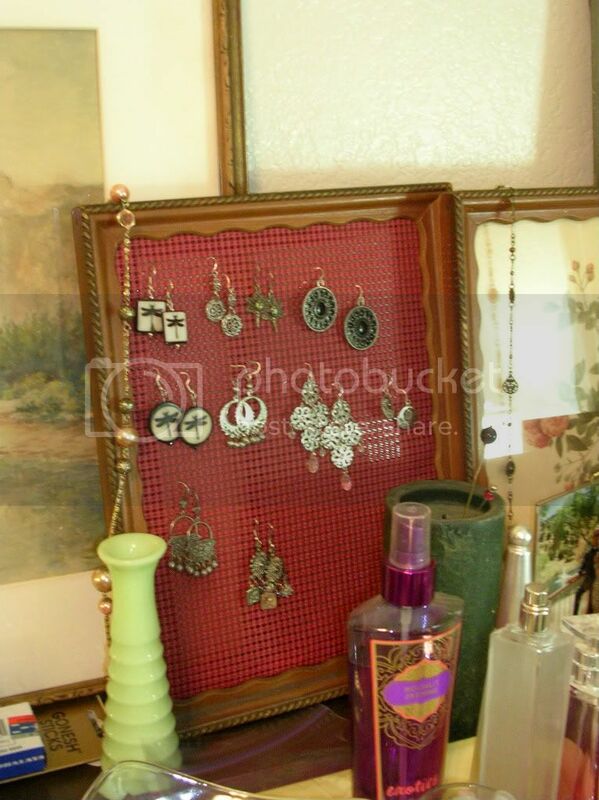 I love the vintage frame earring holder! I’m going to be featuring a new small business owner on my blog, Small Biz Review this week! How cool is that?! Would love for you to come on by and check it out later. I look forward to reading your blog!!! You can take a looksy when your ready.